Enhancing teachers’ pedagogical content knowledge (PCK) is essential to improving the teaching and learning of mathematics. 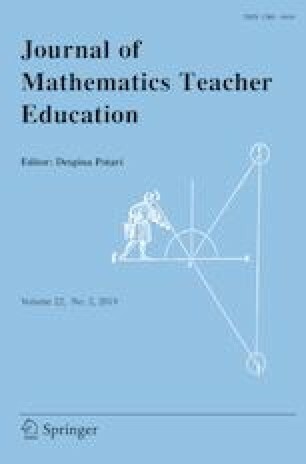 Mathematics teacher educators (MTEs) need to help prospective teachers enhance PCK (Marks in J Teach Educ 41(3):3–11, 1990. doi: 10.1177/002248719004100302; Mason 2008). However, we know very little about the practices of MTEs, especially in mathematics content courses, as these practices are not widely researched or disseminated (e.g., Bergsten and Grevholm, in: Jaworski, Wood (eds) The international handbook of mathematics teacher education, vol 4, Sense Publishers, Rotterdam, pp 223–246, 2008; Floden and Philipp, in: Lester, Ferrini-Mundy (eds) Proceedings of the NCTM research catalyst conference, National Council of Teachers of Mathematics, Reston, pp 171–176, 2003). This phenomenographical study offers empirical findings on commonly identified purposes across ten expert MTEs who provided K-8 prospective teachers with opportunities to develop PCK in their mathematics content courses. Furthermore, our emergent findings indicated that expert MTEs also provided opportunities for prospective teachers to develop orientations toward teaching the subject, which prompted framework adaptations and articulations of “orientations” as a construct discussed in the broader literature outside of mathematics teacher education research (Magnusson et al., in: Gess-Newsome, Lederman (eds) Examining pedagogical content knowledge, Kluwer, Dordrecht, pp 95–132, 1999). Research and practitioner implications from this study provide specific PCK-related learning opportunities of prospective teachers through the lenses of expert MTEs’ (personal and professional) purposes and reflections on teaching, as a foundation on which the field can continue building future research and MTEs can continue building their practice in mathematics content courses. Australian Curriculum and Assessment Reporting Authority [ACARA]. (2014). Foundation to year 10 curriculum: Mathematics. Retrieved from http://www.australiancurriculum.edu.au/mathematics/aims.